In order to achieve a successful intubation, various classes of medications are needed to achieve specific pharmacologic effects. These effects include providing sedation, analgesia from pain, amnestic effects, anesthesia, anticholinergic effects to control secretions, and paralysis. Intubation, when performed using the rapid sequence intubation (RSI) protocol, is typically discussed in several stages (ie, pretreatment, induction and paralysis, and post-intubation); each stage requires specific medications. The medication choices described below provide the specific effects that are essential to creating the optimal conditions for endotracheal intubation. For complete information, see Rapid Sequence Intubation. The image below depicts an inserted endotracheal tube. 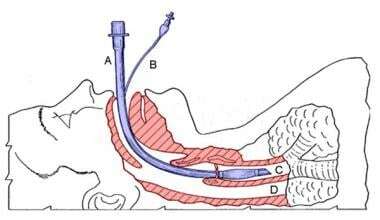 Diagram of an inserted endotracheal tube. Image courtesy of Wikimedia Commons. Oxygenation before rapid sequence intubation (RSI) is a critical step aimed at maximizing blood oxygen saturation levels and creating an oxygen reservoir in the lungs to eliminate the need for bag-valve-mask (BVM) ventilation. Preoxygenation may be the most critical of all steps involved in RSI. The oxygen reservoir permits continued oxygenation of pulmonary circulation, eliminating the need for BVM ventilation for the period of apnea after induction and paralysis to minimize the risk of stomach insufflation and aspiration. This process is dependant on a properly fitted mask with a constant and unbroken seal maintained with 2 hands. Nitrogen constitutes about 80% of ambient air. During oxygenation, oxygen replaces nitrogen at the alveolar level. This results in what is known as nitrogen washout, thus creating an oxygen reservoir in the functional residual capacity of the lungs. Ninety-five percent of nitrogen elimination occurs in 2 minutes. Preoxygenation before induction and paralysis allows up to 8 minutes of apnea time in healthy adults before arterial oxygen desaturation below 90% occurs. The desaturation rate is more rapid in children because of their higher baseline metabolic rate. The same is true for adults who are obese or acutely ill, given their higher oxygen demand. Preoxygenation may be accomplished through various protocols, depending on the characteristics of the patient. The most straightforward protocol is to deliver high-flow oxygen via a nonrebreather face mask to a spontaneously breathing patient for 3 minutes. Baraka and colleagues also showed that 8 deep breaths over 60 seconds, by using full vital capacity, gives the same partial oxygen tension (PaO2) as the standard 3 minutes of tidal volume breathing of 100% BVM oxygenation. The time required to reach oxygen desaturation is the same for either technique. The deep breath method should be considered a reasonable alternative to the traditional 3-minute tidal volume technique when time is of the essence. Although the goal is to avoid BVM ventilation after induction and paralysis, continued bagging may be necessary for patients whose blood oxygen saturation drops below 90% for any reason (eg, unsuccessful intubation, patient characteristics noted above). If necessary, bagging should be performed with cricoid pressure in order to compress the esophagus and minimize stomach insufflation and aspiration. The direct stimulation of the pharynx, larynx, and trachea by the laryngoscope blade itself can cause a pressor response, which is a sympathetic nervous system reflex with a measurable increase in plasma catecholamines consisting of transient increase of blood pressure (up to a 35-mm Hg increase in the mean arterial pressure [MAP]) and a heart rate increase (up to 30 bpm). These hemodynamic changes typically last less than 5 minutes. In rare cases, transient dysrhythmias may be induced. Despite this, no study to date has linked the pressor response to subsequent clinical deterioration, although it is still considered useful to minimize its effect. Numerous agents have been used for attenuation of the pressor response, including lidocaine, fentanyl, sufentanil, alfentanil, and esmolol. The literature does support the use of lidocaine as a cough suppressant, probably achieved by means of either brainstem depression or peripheral anesthesia of the trachea and the pharyngeal cough receptors. Studies of the effects of lidocaine on the cardiovascular response to intubation are less convincing. The data are confusing, conflicting, and, for the most part, not adequately controlled. Fentanyl, a rapid-acting synthetic opioid, is also effective in blunting the sympathetic response to laryngoscopy and intubation. Opioids may be superior to lidocaine in blunting the pressor response at appropriate doses. Opioid receptors are found in the cardiovascular regulatory center, the sympathetic nervous system, the vagal nuclei, and the adrenal medulla. These precise locations of receptors enable fentanyl to significantly blunt the hemodynamic responses to hypopharyngeal noxious stimulation. Pharmacokinetically, fentanyl has a rapid onset of 1 minute and a duration of action of 30 minutes. The dose for complete sympathoadrenal blockade is greater than 7 mcg/kg, although recommended doses for pretreatment for intubation in the emergency department is 3 mcg/kg to avoid hypotension in patients dependent on sympathetic tone. Although thoracic and abdominal muscular rigidity is a concern, the incidence is extremely low and usually only observed when high doses (ie, >15 mcg/kg) are used. Esmolol is essentially the only beta-blocker that could be used as a pretreatment agent because it is beta-1 selective, it possesses a rapid onset of action, and it has an ultrashort duration of effect. Its onset of action is within seconds, and its elimination half-life is 9 minutes. Its dose in this situation is 1 mg/kg administered as a simple bolus 2 minutes before intubation. Feng and colleagues compared lidocaine 2 mg/kg, fentanyl 3 mcg/kg, and esmolol 2 mg/kg and found that only esmolol offered reliable protection against increases in both heart rate and systemic blood pressure. Helfman and colleagues conducted a similar study in 1991 and found that fixed doses of lidocaine 200 mg, fentanyl 200 mcg, and esmolol 150 mg produce similar results because only the esmolol provided consistent and reliable protection against the pressor response. Other studies have showed that when 2 pretreatment drugs are used together, a technique known as synergism occurs, which is a beneficial result with a marked decrease in the dosing of each of the involved drugs. However, certain patients may benefit from esmolol during RSI, including patients with acute coronary syndrome and those with suspected dissecting thoracic aneurysms. Again, though avoiding any potential transient increase in heart rate and blood pressure in critical patients is prudent, no study has established a direct relationship between this autonomic reflex and an increase in mortality risk. Just as physical stimulation of the airway causes a sympathomimetic reflex response, the same manipulation causes a transient increase in intracranial pressure (ICP). Possible mechanisms of action include simply coughing and gagging and subsequent transmission of intrathoracic pressure to the cranium. Also, the catecholamine release induced by airway manipulation and its inherent increased MAP probably plays a role. Remember, cerebral oxygenation is determined by cerebral perfusion pressure (CPP), which is defined as CPP = MAP - ICP. Normal CPP is 80-100 mm Hg and must be maintained above 50 mm Hg to maintain cerebral autoregulatory functions. These cerebral autoregulatory mechanisms are impaired in patients with significant head injuries, subarachnoid hemorrhage, or acute elevations in hemodynamics in association with head injury. Normal ICP is less than 10 mm Hg, but it may rise above 60 mm Hg in patients with cerebral injuries. Even in patients without head injury, endotracheal suction and laryngeal manipulation cause an average increase of 22 mm Hg. Any significant increase in ICP or decrease in MAP may result in a critical decrease in CPP, contributing to a further cycle of cerebral ischemia/edema and elevation of ICP with a possibility of permanent neurologic dysfunction as a sequela. Again, although the exact meaning and significance of these data (mostly derived in the operating room) are unclear, regulating this response in the at-risk patient seems prudent. Lidocaine 2 mg/kg blunts the cough and gag reflex, thereby halting transmission of intrathoracic pressure to the cerebrum. However, in a patient who is paralyzed, this is not a concern. The decrease in ICP is most probably related to its sympatholytic activity. Lidocaine also decreases cerebral metabolism and stabilizes cell membranes by blocking membrane sodium channels. Prophylactic lidocaine also obtunds the rise in intraorbital pressure that accompanies tracheal manipulation. This response is independent of paralytic agents. The best results have been demonstrated in patients who are paralyzed, suggesting that paralysis itself may be the best method to attenuate any potential elevations of ICP by inhibiting the cough reflex. In a patient who is paralyzed, the effectiveness of lidocaine is not clear, but it may be beneficial in blunting the pressor response and, indirectly, ICP elevations. Some have also advocated in the past the use of "defasciculating doses" of a paralytic agent in order to prevent the defasciculations encountered with the administration of succinylcholine, which have been thought to possibly increase ICP. These doses were typically one-tenth the paralyzing dose of a noncompetitive paralytic agent, such as vecuronium or pancuronium. This practice has fallen out of favor in the setting of suspected elevated ICP because of the lack of supporting data. Children and infants tend to have a more pronounced vagal response to laryngoscopy, which can result in bradycardia. For this reason, the current recommendation for children younger than 1 year undergoing direct laryngoscopy is administration of atropine 0.02 mg/kg, independent of succinylcholine use. Previous recommendations indicated that all children younger than 10 years receive atropine prior to intubation, but this has now fallen out of favor because of the lack of supporting data. The induction phase of rapid sequence intubation (RSI) is used to produce anesthesia and rapid unresponsiveness. In 1934, John Lundy introduced the first case in which thiopental was used. Today, numerous pharmacologic classes of drugs are used, although etomidate is the most common agent used in the ED for this purpose. The ideal drug produces rapid unconsciousness, has a short duration of action, and causes minimal alterations in hemodynamics, respirations, and intracranial pressure (ICP). It should also have the ability to be easily stored and readily available for use. Although most sedatives cause some cardiovascular depression, these effects are exaggerated in patients who are acutely ill, many of whom are hypovolemic or hypotensive. The clinical status of a given patient often dictates which induction agent should be used. Factors to consider include altered hemodynamics, suspected ICP abnormalities, and reactive airway disease. Etomidate is now considered the criterion standard of induction agents in its use in RSI. Etomidate is an ultrashort-acting nonbarbiturate hypnotic agent that has been used since the 1970s in Europe. Its advantages are rapidity of onset, short duration of action, lack of cardiodepressant effects, marked safety in patients with head injury, and minimal adverse effects. Indeed, these features support it as the ideal sedative for RSI. The dose for RSI is 0.3 mg/kg IV, or a typical adult dose of 20 mg. Etomidate is available as a solution of 20 mg/mL and may be stored at room temperature with a long shelf life. Although it does not have any direct effect on muscle tone, it may enhance the effects of paralytics. Etomidate is a potent sedative hypnotic induction agent via its binding GABA2 receptor, though it lacks analgesic properties. It is a carboxylated imidazole that is both water- and lipid-soluble. It rapidly accumulates in vascular organs, producing unconsciousness within 30 seconds and reaching peak brain concentration in 1 minute. Its high potency causes unconsciousness within 1 arm-brain circulation time and lasts less than 10 minutes after a simple bolus injection. Because of its lipophilic properties, the redistribution half-life is 2.6 minutes, which accounts for its short duration of action. It is rapidly hydrolyzed in the liver and plasma, forming an inactive metabolite excreted in the urine. Unlike other induction agents, etomidate does not depress the cardiovascular system because the sympathetic outflow and baroreceptor reflexes are maintained. However, because it lacks analgesic effect, laryngoscopy itself may induce sympathetic stimulation, and slight transient hypertension may ensue. Etomidate acts on the CNS to stimulate gamma-aminobutyric acid (GABA) receptors and, in doing so, depresses the reticular activating system. The electroencephalogram (EEG) changes are similar to those produced by barbiturates as the patient passes rapidly through light to deep levels of surgical anesthesia. This agent decreases cerebral oxygen consumption by 45% and cerebral blood flow by 34%, thereby decreasing ICP. Interestingly, only a minimal change in the cerebral perfusion pressure (CPP) is noted. This unique property of acutely decreasing the ICP while maintaining normal hemodynamics places etomidate in a class alone in the arena of induction agents. These properties and its extreme and rapid potency make etomidate the drug of choice for virtually all cases of RSI. Etomidate blocks 11B-hydroxylase, the enzyme that converts 11-deoxycortisol to cortisol in the last step in this corticosteroids synthesis. This transient dose-dependent inhibition of adrenocortical activity may last 5-15 hours; however, in the setting as an induction agent, this appears to be clinically insignificant. Hohl et al conducted a systematic review to compare a bolus dose of etomidate with other induction agents for rapid sequence intubation. Measured outcomes included adrenal function, mortality, and health services utilization. Pooled data suggest that etomidate has no significant effect on mortality and that it suppresses adrenal function transiently. Evidence to show a difference in ventilator use or in ICU or hospital lengths of stay was insufficient. Nausea, vomiting, myoclonus, and laryngospasm are other reported adverse effects but are usually attenuated by paralysis and are more of a concern when etomidate is used in conscious sedation. No absolute contraindications to its use in RSI exist. Ketamine is a phencyclidine (PCP) derivative that been available for more than 30 years. It is an ideal induction agent for RSI because it produces rapid sedation, has a brief duration of action, and is extremely potent. It possesses both analgesic and amnesic properties and is stable at room temperature. This agent also has a long shelf life. Ketamine is highly lipid soluble and accumulates rapidly in highly vascular organs when it undergoes rapid redistribution. Because of this feature, anesthesia is produced in less than 1 minute. The half-life of redistribution is only 7-11 minutes, and the half-life of elimination is 2-3 hours after its degradation in the liver. Most other anesthetic agents work by depressing the reticular activating system. However, ketamine acts by interrupting pathways between the thalamocortical and limbic systems. Patients enter a trancelike state and are unaware of surroundings, even with their eyes wide open. Because of the properties of ketamine, it is often described as a dissociative anesthetic. The patient has slow nystagmus in a nonsleep (sort of cataleptic) state associated with a dose-related CNS depression characterized by profound amnesia and analgesia. The dose for induction is 2 mg/kg IV with clinical recovery in 10-15 minutes. Ketamine is the induction agent of choice in patients with bronchospasm because it is the only agent with bronchodilatory properties. Although the bronchial smooth muscle relaxes, airway reflexes remain intact. Bronchial secretions are also increased, which may decrease the incidence of mucus plugging in patients with asthma. Studies have shown that when ketamine is used in patients with asthma who are dependent on ventilators, respiratory acidosis and airway pressures are decreased compared to control subjects. The direct negative inotropic effect on the myocardium is masked by an increase in blood pressure, heart rate, cardiac output, and an overall decrease in myocardial oxygen consumption. Ketamine is not recommended in patients with uncontrolled hypertension or in those in whom hypertension should be avoided (eg, elevated ICP, aortic dissection or aneurysm, myocardial infarction). On the other hand, ketamine may be ideal for those with hypotension, such as those experiencing hemorrhagic, hypovolemic, or septic shock. The only real clinical concern for the use of ketamine in RSI is its inherent property as a potent cerebral vasodilator. The tendency to produce postanesthesia visual, auditory, and proprioceptive hallucinations, called emergence phenomena, is more of a concern when ketamine is used as a conscious sedative in painful procedures than in RSI. This effect can be blunted with concomitant use of a benzodiazepine. Of note, emergence phenomena are rare in children, and rates as high as 30% have been reported in adults. Various degrees of hypertonus and skeletal-muscle movement are also occasionally observed. The barbiturates thiopental and methohexital, although used more frequently in the past, have a limited role in the ED as induction agents because of their cardiorespiratory depressant activity. Of all the barbiturates, these possess the shortest onset and briefest duration of action, with methohexital ahead of thiopental. Classified as a sedative hypnotic, 2,6-diisopropylphenol (propofol) is relatively new as an induction agent in RSI. It is extremely lipophilic and distributes itself rapidly throughout the brain and other vascular tissues. For this reason, it must be maintained in an emulsion state to remain in solution. The induction dose is 2 mg/kg, and it produces a dose-dependent and potent depression of consciousness ranging from light sedation to a comatose state. While it lacks any analgesic activity, it does have amnesic properties. Like etomidate, it has an extremely rapid onset within 1 arm-brain circulation time of about 20 seconds and a likewise a short duration of action of 10-15 minutes. Like thiopental, propofol decreases cerebral metabolism and, consequently, ICP. Unfortunately, propofol is a myocardial depressant, causing a decrease in mean arterial pressure (MAP). This is compounded by the decrease in the systemic vascular resistance it causes. Both of these factors contribute to an overall decrease in oxygen delivery. These adverse cardiovascular effects are greater than those of the barbiturates and are dose-dependent. The role for propofol may be in the need to intubate a patient with a sympathomimetic drug-induced excited delirium or seizures, especially if ongoing sedation with a constant infusion of propofol is likely to be continued in the intensive care unit. Propofol depresses pharyngeal and laryngeal muscle tone and reflexes more than the other induction agents mentioned. Respiratory depression may also be observed and is dose-dependent. Although these misgivings are serious shortcomings in its use in RSI, the ultrashort onset, brief duration of action, and extreme potency should be acknowledged. Although this agent has the most rapid onset of all the benzodiazepines, it falls far short in this category compared with other classes of induction agents. Midazolam has the major disadvantage of requiring titration, which is far from feasible in RSI. Also, optimal effects are not observed for 3-5 minutes. This time does not allow the patient to be properly anesthetized if the midazolam is administered immediately before succinylcholine. In fact, studies have shown that patients are awake if midazolam is administered back to back with succinylcholine. Although the standard dose for RSI is 0.1 mg/kg, doses as high as 0.3 mg/kg have not consistently induced true unconsciousness. Midazolam does mildly decrease CPP. Also, minimal cardiovascular and respiratory effect may be observed. Because of its slow onset and variable potency, midazolam is no longer recommended as a first-line induction agent in RSI. All drugs administered for RSI must possess rapid onset and extreme potency. In normal neurotransmission, the neurotransmitter acetylcholine (Ach) is released from the nerve ending into the neuromuscular junction (NMJ). This occurs secondary to propagation of an action potential along the axon, which results in the opening of calcium channels at the nerve terminal. The flux of calcium ions triggers the release of Ach into the NMJ. Ach diffuses across this gap and binds to nicotinic receptors on the muscle cell endplate opposite the site of the neuronal end terminals. Two molecules of Ach are required at each nicotinic receptor in order for the sodium and potassium ion channels to open. After the threshold of the motor endplate is reached, the muscle membrane is depolarized and excitation-contraction coupling is initiated. After binding, Ach is rapidly hydrolyzed by the enzyme acetylcholinesterase at the NMJ, terminating the stimulatory process, and the muscle membrane repolarizes. Paralyzing agents act by interfering with this process at the NMJ. Neuromuscular blockade (NMB) agents are divided into 2 general classes based on their mechanism of action at the NMJ: depolarizing and nondepolarizing agents. Depolarizing agents mimic the action of Ach by producing depolarization of the postjunctional membrane, acting as a receptor agonists. Nondepolarizing agents are competitive antagonists of Ach and contend for the Ach subunits of the postjunctional glycoprotein receptors. This prevents changes in the permeability of the postjunctional membrane, thereby not allowing depolarization to occur. Administering a paralytic agent without a potent and effective induction agent is inhumane. It is of utmost importance that this induction agent have an onset of action faster than or at least the same as that of the paralytic agent. Succinylcholine was introduced in 1949 and has passed the test of time. To this day, succinylcholine is the only depolarizing agent used for rapid sequence induction. Because of its rapid onset, ultrashort duration of action, and safety, it is the paralytic of choice in almost all cases of rapid sequence induction in adults. This depolarizing agent works via persistent activation and resultant blockade of the postsynaptic nicotinic acetylcholine receptor at the neuromuscular junction. In contrary, nondepolarizing agents competitively block the binding of acetylcholine at the same postsynaptic receptor. Structurally, succinylcholine is 2 Ach molecules linked together by methyl groups. This binds and stimulates the Ach receptor on the postsynaptic neuromuscular endplate, causing ion channels to open and sodium influx to occur. Unlike Ach, succinylcholine produces continuous stimulation of the nicotinic receptor, and the endplate membrane remains depolarized with the channel open. The resulting skeletal muscle paralysis occurs because the hydrolysis of succinylcholine is slow compared with Ach. This sustained depolarization renders the postjunctional membrane unable to respond to subsequent release of Ach because rapid fatigue of the muscle occurs. In essence, the endplate and adjacent sarcolemma are refractory to subsequent stimulation. Paralysis proceeds from the small, distal, rapidly moving muscles to the proximal, slowly moving muscles. The diaphragm is one of the last muscles to relax. Succinylcholine is rapidly hydrolyzed in the serum by the enzyme pseudocholinesterase and, subsequently, only a small amount ever reaches the NMJ. The end metabolites, succinic acid and choline, have no NMB activity. In fact, pseudocholinesterase is not present in the NMJ and exerts its effect systemically before succinylcholine ever reaches the Ach receptor. Once attached to the Ach receptor, succinylcholine is active until it diffuses back into the serum via the large concentration gradient induced by the rapid action of pseudocholinesterase. These biochemical properties are unmatched by any other NMB agent and have made succinylcholine the criterion standard for rapid neuromuscular paralysis in rapid sequence intubation; thus, the efficacy of all other NMB agents are compared with that of succinylcholine. Succinylcholine is available as a 20-mg/mL solution and can be stored for as long as 3 months at room temperature while maintaining 90% of its original activity (slightly more if protected from light). Therefore, to potentially lessen spontaneous degradation, succinylcholine should be located on an airway cart near the resuscitation bays and not far away in a remote refrigerator. Proper inventory ensures that it does not remain unused longer than 3 months. The dose is 1.5 mg/kg in adults and 2 mg/kg in children younger than 5 years. Muscle relaxation occurs in just 30 seconds, with total paralysis in 45 seconds. The duration of action is short, lasting 7-10 minutes. Of note, chronic renal failure is not a contraindication to succinylcholine use; however, in the patient with potential hyperkalemia, such as the patient who has missed hemodialysis, alternative agents should be considered for neuromuscular paralysis. Extensive crush injuries and burns sustained more than 7 days earlier may produce more pronounced hyperkalemia. Patients with large strokes or spinal cord injuries are at risk for hyperkalemia starting about one week after the incident until neuronal regeneration or atrophy has completed. Patients with multiple sclerosis (MS) or amyotrophic lateral sclerosis (ALS) have an ongoing risk of hyperkalemia depending on the activity of their disease. Patients with active myopathy are at greatest risk for succinylcholine-induced hyperkalemia. Despite this, cases of fatal and near-fatal hyperkalemic cardiac arrest are rare. Most cases that have been reported occurred in children with undiagnosed myopathies, none of which occurred in the emergency department, and most had concomitant use of halothane. Furthermore, although the US Food and Drug Administration (FDA) no longer recommends succinylcholine for use in elective pediatric surgery because of undiagnosed myopathies and fear of subsequent hyperkalemia, it still may be used for emergency endotracheal intubation in children. However, dosing should never be repeated if the airway cannot be intubated during the first succinylcholine-induced muscle relaxation period, as bradydysrhythmias and asystole have occurred. In noncritical situations, alternative neuromuscular agents should be considered in children 8 years and younger. The literature does support the use of succinylcholine in the acute setting outside of any known myopathy or a known case of documented or presumed preintubation hyperkalemia. The larger elevations observed in chronic diseases are thought to be the effects of extrajunctional Ach receptor proliferation that occurs in states of neuronal regeneration. This provides more sites for outward potassium efflux in the presence of succinylcholine. Approximately 3 per 10,000 patients, or 0.03% of the general population, have a defective version of plasma pseudocholinesterase, and they cannot metabolize succinylcholine properly. These individuals possess a decrease affinity for the succinylcholine molecule and a decreased ability to hydrolyze it. In the heterozygote, paralysis may last up to twice the expected duration, but in the homozygote, paralysis may persist for several hours. Known pseudocholinesterase deficiency is an absolute contraindication for succinylcholine use. Many drugs have the potential to lower pseudocholinesterase levels. Of importance in emergency care, patients with cocaine intoxication may experience prolonged muscle paralysis with succinylcholine use. This is because cocaine is metabolized by the plasma pseudocholinesterases, and, in doing so, it acts as a competitive antagonist. Other important agents are the anticholinesterase agents, which include organophosphate and carbamate pesticides, drugs used for myasthenia gravis, such as pyridostigmine, and drugs used for the treatment of Alzheimer's disease, such as tacrine, donepezil, rivastigmine, and galantamine. The succinylcholine-induced rise in intraocular pressure (IOP) is minimal (3-8 mm Hg). The mechanism for this slight elevation in pressure may be due to tonic contraction of extraocular muscles, choroid vascular dilation, or relaxation of orbital smooth muscle. Of importance, this is significantly less than the elevation caused by coughing, hypoxemia, or direct laryngoscopy without a paralytic agent. Even a normal blink of the eyelid can increase the IOP by 10-15 mm Hg. No case of intraocular content expulsion has been reported. Malignant hyperthermia is a rare disorder that has to do with an excessive release of cytosolic calcium by means of an abnormal ryanodine receptor. This occurs in 1 in 15,000 adults and in 1 in 50,000 children. This rare syndrome consists of muscular rigidity, extreme hyperpyrexia, hypoxemia, hypercarbia, rhabdomyolysis, autonomic instability, metabolic acidosis, and disseminated intravascular coagulation (DIC). Aggressive fluid resuscitation and cooling measures are critical. Early recognition by elevation of end tidal CO2 monitoring or increased airway resistance should prompt early dantrolene infusion, to lessen mortality and morbidity. Masseter muscle spasm is much more common than malignant hyperthermia, occurring in 0.3-1% of children. This creates a worrisome situation for the practitioner in which strong contraction of all the masseter muscles clench the mandible. Management should be to continue ventilation and administer a nondepolarizing agent. Because of the relationship between this and subsequent development of malignant hyperthermia, the patient's condition and his or her serum electrolyte and creatine kinase levels, and vital signs should be closely monitored for 24 hours. Although the adverse effects for succinylcholine are extraordinarily rare, concern for such has prompted investigators to search for an alternative in a shorter-acting nondepolarizing NMB agent. Rocuronium is an aminosteroid muscle relaxant structurally related to vecuronium, though it is more lipophilic and consequently is 3 times as rapid as the latter. It possesses the fastest onset of action of all the nondepolarizing NMB agents, close to that of succinylcholine. At a dose of 0.6 mg/kg, its onset is 60-90 seconds. It is also available as a solution, unlike the other nondepolarizing agents, so drug preparation is reduced. Similar to pancuronium, it possesses some vagolytic properties. In further support of the quick onset of action of rocuronium, other investigators point out that the onset at the level of the vocal cords may be quicker than published. After it is administered, the NMB of the diaphragm is slower than laryngeal muscles and slowest at the adductor pollicis muscle, which is often attached to standard twitch monitoring devices. Therefore, conditions for intubation at the vocal cord level may be ideal before peripheral paralysis occurs. Like rocuronium, this is a newer NMB agent. It is a bisquaternary benzylisoquinolinium compound structurally similar to atracurium. Because of its rapid hydrolysis by plasma cholinesterases, the duration of action (15-20 min) is classified as short, only 2 times as long as succinylcholine. The typical dose is 0.15-3 mg/kg. Because of the ongoing search for alternatives for succinylcholine, interest in mivacurium is increasing. Two drawbacks are that the onset is 2-2.5 minutes, which is delayed compared to succinylcholine, and that substantial histamine release occurs with rapid intravenous boluses. However, using techniques such as priming and synergism, the onset can be subsequently reduced, possibly making mivacurium more suitable for RSI. Molbegott and Baker demonstrated that by preceding an intubating dose of mivacurium 0.2 mg/kg with a priming dose of 0.015 mg/kg, the resulting intubation times and conditions are clinically similar to that produced by succinylcholine. Also, increasing the dose shortens the time for maximal blockade to develop. In 1995, Cook and colleagues have shown that, in children, increasing the dose creates an onset time to complete NMB similar to that of succinylcholine. Like rocuronium, mivacurium is a reasonable alternative when succinylcholine is contraindicated. Although attractive, mivacurium falls short in matching succinylcholine in its simplicity, ultrashort onset, and short duration of action. Pancuronium is an aminosteroid NMB. Because the time of onset for paralysis is up to 3 minutes and the duration of action is 60 minutes, the role for this drug is mostly limited to postintubation paralysis. The typical dose is 0.1 mg/kg, although increasing the dose has cumulative effects. Pancuronium causes histamine release and possesses vagolytic properties. Cis- atracurium is a single cis-cis isomer of atracurium, which is enzymatically degraded by hydrolysis in the plasma (Hoffman elimination). By isolating the potent cis-cis isomer from atracurium, which is a mixture of 10 stereoisomers, the onset of action with this agent is reduced to 2-3 minutes. It also does not cause histamine release in doses used. Only rocuronium and cis -atracurium are classified as pregnancy category B agents; all others are pregnancy category C. The role of cis -atracurium is limited to use in pregnancy, in patients with advanced hepatic disease, and in children. Adult doses are 0.15-0.2 mg/kg, and the pediatric dose is 0.1 mg/kg. Like other nondepolarizing agents, its duration of action, up to 75 minutes, is longer than succinylcholine, limiting its use in emergency situations. What are the types of medications used in tracheal intubation? What is the role of preoxygenation in a tracheal intubation procedure? What are various protocols used to administer preoxygenation for tracheal intubation? How does pressor response affect the pretreatment stage of tracheal intubation? Which agents are used for attenuation of the pressor response prior to tracheal intubation? What is the role of lidocaine in the attenuation of the pressor response prior to tracheal intubation? What is the role of fentanyl in the attenuation of the pressor response prior to tracheal intubation? What is the role of sufentanil in the attenuation of the pressor response prior to tracheal intubation? What is the role of esmolol in the attenuation of the pressor response prior to tracheal intubation? How do lidocaine, fentanyl, and esmolol compare as agents for attenuation of the pressor response prior to tracheal intubation? How does intracranial hypertension affect the pretreatment stage of tracheal intubation? What is the role of lidocaine in decreasing intracranial hypertension prior to tracheal intubation? How are elevations of intracranial pressure (ICP) managed prior to tracheal intubation? What is the recommendation for pretreatment of children undergoing tracheal intubation? When should pretreatment medications be administered prior to tracheal intubation? What is the role of etomidate in the induction stage of tracheal intubation? What is the role of ketamine in the induction stage of tracheal intubation? What is the purpose of the induction stage of tracheal intubation? What is the mechanism of action for etomidate during the induction stage of tracheal intubation? What is the efficacy of etomidate during the induction stage of tracheal intubation? What are the adverse effects of etomidate during the induction of tracheal intubation? What is the agent of choice during the induction stage of tracheal intubation for patients with bronchospasm? What are the negative effects of ketamine in the induction stage of tracheal intubation? What are the roles of thiopental and methohexital in the induction stage of tracheal intubation? What is the role of propofol in the induction stage of tracheal intubation? What is the role of midazolam in the induction stage of tracheal intubation? What is the role of induction medications in tracheal intubation? What is the role of succinylcholine in a tracheal intubation procedure? What is the role of pancuronium in the paralysis stage of tracheal intubation? What happens during the paralysis stage of tracheal intubation? What is the benefit of paralytic agents during tracheal intubation? What is the mechanism of action for succinylcholine in the paralysis stage of tracheal intubation? What is the dosage and shelf life of succinylcholine for use in tracheal intubation? What are the adverse effects of succinylcholine in a tracheal intubation procedure? Which patients are at risk for succinylcholine-induced hyperkalemia during tracheal intubation? What are possible complications of succinylcholine in tracheal intubation? How much is the succinylcholine-induced rise in intraocular pressure (IOP) during tracheal intubation? What causes malignant hyperthermia during tracheal intubation? What causes masseter muscle spasm during tracheal intubation? What is a common misconception about the use of paralytic agents in tracheal intubation? What is the role of rocuronium in a tracheal intubation procedure? What is the major disadvantage of using rocuronium in the paralysis stage of tracheal intubation? How effective is rocuronium in the paralysis stage of tracheal intubation? What is the role of mivacurium in the paralysis stage of tracheal intubation? How effective is mivacurium in the paralysis stage of tracheal intubation? What is the role of cisatracurium in the paralysis stage of tracheal intubation? What is the role of sugammadex sodium (Bridion) in tracheal intubation procedures? What is the role of paralytic agents in tracheal intubation procedures? Scott D. Preoxygenation, Reoxygenation, and Delayed Sequence Intubation in the Emergency Department. WeingartThe Journal of Emergency Medicine. 08 June 2011. Vol. 40, No. 6:661-667. Baraka AS, Taha SK, Aouad MT, El-Khatib MF, Kawkabani NI. Preoxygenation: comparison of maximal breathing and tidal volume breathing techniques. Anesthesiology. 1999 Sep. 91(3):612-6. [Medline]. Bromage PR, Robson SG. Concentration of lidocaine in blood after intravenous, intramuscular, epidural and endotracheal administration. Anesthesia. 1961. 16(1):45-61. Lev R, Rosen P. Prophylactic lidocaine use preintubation: a review. J Emerg Med. 1994 Jul-Aug. 12(4):499-506. [Medline]. Tanaka Y, Nakayama T, Nishimori M, Tsujimura Y, Kawaguchi M, Sato Y. Lidocaine for preventing postoperative sore throat. Cochrane Database Syst Rev. 2015 Jul 14. 7:CD004081. [Medline]. Pathak D, Slater RM, Ping SS, From RP. Effects of alfentanil and lidocaine on the hemodynamic responses to laryngoscopy and tracheal intubation. J Clin Anesth. 1990 Mar-Apr. 2(2):81-5. [Medline]. Feng CK, Chan KH, Liu KN, Or CH, Lee TY. A comparison of lidocaine, fentanyl, and esmolol for attenuation of cardiovascular response to laryngoscopy and tracheal intubation. Acta Anaesthesiol Sin. 1996 Jun. 34(2):61-7. [Medline]. Helfman SM, Gold MI, DeLisser EA, Herrington CA. Which drug prevents tachycardia and hypertension associated with tracheal intubation: lidocaine, fentanyl, or esmolol?. Anesth Analg. 1991 Apr. 72(4):482-6. [Medline]. Donegan MF, Bedford RF. Intravenously administered lidocaine prevents intracranial hypertension during endotracheal suctioning. Anesthesiology. 1980 Jun. 52(6):516-8. [Medline]. Vaillancourt C, Kapur AK. Opposition to the use of lidocaine in rapid sequence intubation. Ann Emerg Med. 2007 Jan. 49(1):86-7. [Medline]. Drug Facts and Comparisons. Wolters Kluwer Health, Inc. [book on CD-ROM]. 2008. McEvoy GK. Skeletal Muscle Relaxants. AHFS Drug Information 2008. Bethesda: American Society of Health-System Pharmacists, Inc. 2008. Sparr HJ. Rapid-sequence intubation with non-depolarizing muscle relaxants. Acta Anaesthesiol Scand Suppl. 1997. 111:111-3. [Medline]. Schofer JM. Premedication during rapid sequence intubation: a necessity or waste of valuable time?. Cal J Emerg Med. 2006. 7(4):75-9. Hohl CM, Kelly-Smith CH, Yeung TC, Sweet DD, Doyle-Waters MM, Schulzer M. The effect of a bolus dose of etomidate on cortisol levels, mortality, and health services utilization: a systematic review. Ann Emerg Med. 2010 Aug. 56(2):105-13.e5. [Medline]. Chan CM, Mitchell AL, Shorr AF. Etomidate is associated with mortality and adrenal insufficiency in sepsis: a meta-analysis*. Crit Care Med. 2012 Nov. 40(11):2945-53. [Medline]. Koenig, KL, Pallin DJ. Still No Reason Not to Use Single-Dose Etomidate for RSI in Septic Patients. Journal Watch Specialties. June 10, 2013. Kropf JA, Grossman MA, et al. Ketamine versus Etomidate for Rapid Sequence Intubation in Traumatically Injured Patients: An Exploratory Study. Annals of Emergency Medicine. 2012. Volume 60, Issue 4, Supplement, S117.:10-01. Hawkins E, Moy HP, Brice JH. Critical airway skills and procedures. Emerg Med Clin North Am. 2013 Feb. 31(1):1-28. [Medline]. Hudetz JA, Pagel PS. Neuroprotection by ketamine: a review of the experimental and clinical evidence. J Cardiothorac Vasc Anesth. 2010 Feb. 24(1):131-42. [Medline]. Reynolds SF, Heffner J. Airway management of the critically ill patient: rapid-sequence intubation. Chest. 2005 Apr. 127(4):1397-412. [Medline]. Walls RM, Brown CA, et al. Emergency Airway Management: A Multi-Center Report of 8937 Emergency Department Intubations:. Journal of Emergency Medicine. January 2010. Vol. 41 No. 4:347-354. McAuliffe G, Bissonnette B, Boutin C. Should the routine use of atropine before succinylcholine in children be reconsidered?. Can J Anaesth. 1995 Aug. 42(8):724-9. [Medline]. Caro DA, Andescavage S. Pupillary Response to Light is Preserved in the Majority of Patients Undergoing Rapid Sequence Intubation. Annals of Emergency Medicine. March 2011. Vol. 57, No. 3:234-237. Bhat R, Mazer-Amirshahi M, Sun C, Vaughns J, Dynin M, Tefera E, et al. Accuracy of rapid sequence intubation medication dosing in obese patients intubated in the ED. Am J Emerg Med. 2016 Dec. 34 (12):2423-2425. [Medline]. Sørensen MK, Bretlau C, Gätke MR, Sørensen AM, Rasmussen LS. Rapid sequence induction and intubation with rocuronium-sugammadex compared with succinylcholine: a randomized trial. Br J Anaesth. 2012 Apr. 108(4):682-9. [Medline]. Tryba M, Zorn A, Thole H, Zenz M. Rapid-sequence orotracheal intubation with rocuronium: a randomized double-blind comparison with suxamethonium--preliminary communication. Eur J Anaesthesiol Suppl. 1994. 9:44-8. [Medline]. De Mey JC, Debrock M, Rolly G. Evaluation of the onset and intubation conditions of rocuronium bromide. Eur J Anaesthesiol Suppl. 1994. 9:37-40. [Medline]. Perry JJ, Lee JS, Sillberg VA, Wells GA. Rocuronium versus succinylcholine for rapid sequence induction intubation. Cochrane Database Syst Rev. 2008 Apr 16. CD002788. [Medline]. Molbegott L, Baker T. Speed and ease of tracheal intubation: priming with mivacurium compared with succinylcholine. Can J Anaesth. 1995 Sep. 42(9):780-4. [Medline]. Bridion (sugammadex sodium) [package insert]. Whitehouse Station, NJ: Merck & Co, Inc. December, 2015. Available at [Full Text]. Jiang Y, Chen R, Xu S, Li J, Yu F, Kong L, et al. The impact of prophylactic dexamethasone on postoperative sore throat: an updated systematic review and meta-analysis. J Pain Res. 2018. 11:2463-2475. [Medline].